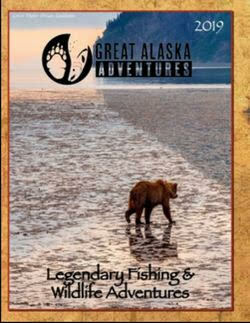 We have been offering our now famous Anchorage Fishing Trips (with transfers) for nearly thirty years. 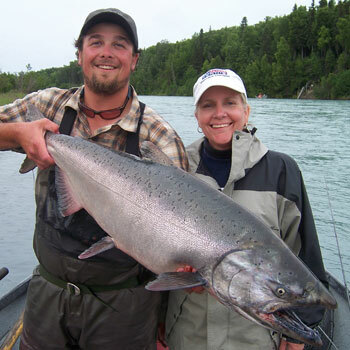 Over 4000 guests have chosen Great Alaska Adventure Lodge to add a day of fishing on the famous Kenai River or an offshore Halibut fishng trip to their inside passage Cruise or independent tour of Alaska. 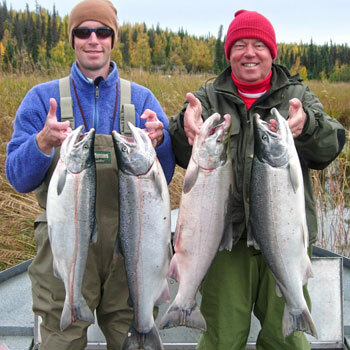 Finding fishing trips from Anchorage often mean a $600.00 fly out experience...great for some folks but not the right fit for everyone. 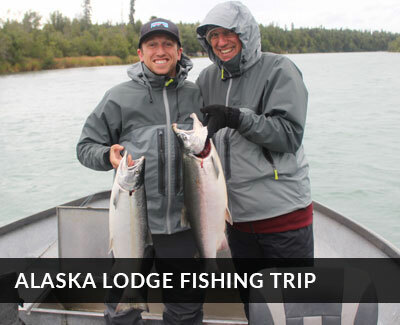 Our "one day fishing from Anchorage" is only is far more affordable, and includes free anchorage pickup and return, lunch at the lodge, your fishing license and 4 to 4.5 hours on the water with one of our great guides. 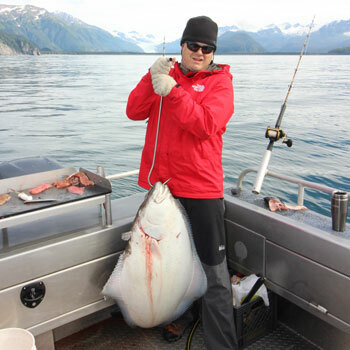 For over 3 decades, Great Alaska has been offering trips in Seward/Resurrection Bay And Cook Inlet (Deep Creek) for daily Halibut fishing excursions. Transfers are not included, but call our office today if you would like to schedule a great day on the water. Minimum of 4 guests for offshore trips. 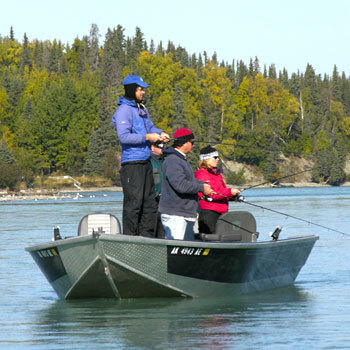 The Kenai River (like all Alaskan rivers) does experience occasional closures or restrictions. 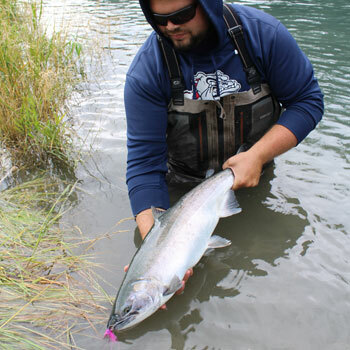 Great Alaska Adventures supports catch and release for King Salmon, and we may focus on Sockeye salmon or Rainbow Trout on those times when the King fishing has been restricted. 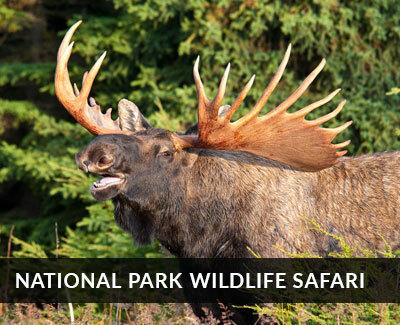 Please be aware that our famous One Day Fishing from Anchorage is a "guides Choice" trip, and we'll focus on whatever species allows us to provide our the best chance for success. Start with a day trip come back for a week! Many folks who met us this way have gone on to book extended stays in following years, so if all you have is a day...give us a chance! 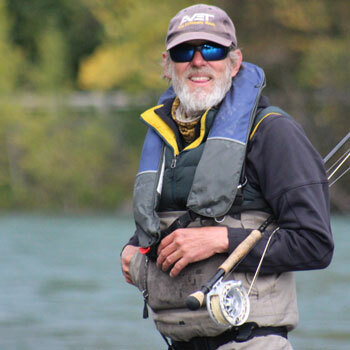 All guides have completed a Kenai River guide training course, are current in first aid and CPR and operate our custom power and drift boats specifically designed for our home river. Personal attention and service is our priority, along with of course getting you into some great fishing!